Michael Nelson (known as ‘Mickey’) was born in 1921. 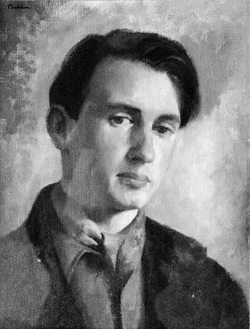 He worked as a journalist before the Second World War, and during the war worked as secretary to John Lehmann, a prominent publisher and man of letters, and served as a captain in the Royal Army Service Corps. After his demobilisation, he lived with his boyfriend in Winchester and owned a bookstore there before meeting Rachel Holland, who knew Nelson was gay but married him anyway; the two remained married the rest of their lives. Nelson and his wife relocated to London, where he was well known in the drinking establishments of Soho. 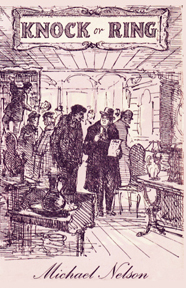 Nelson’s first novel, Knock or Ring (1957), which concerned the illegal practices of the ‘ring’, a group of booksellers who conspired to fix auctions and share profits among themselves, drew on Nelson’s own experiences as a bookseller and received good reviews. 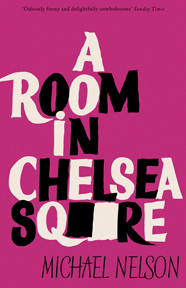 His second book, A Room in Chelsea Square (1958), also available from Valancourt Books, was published anonymously, and has gone on to become a gay classic. His other books are Blanket (1959) (published under the pseudonym ‘Henry Stratton’), When the Bed Broke (1961), Captain Blossom (1973), Captain Blossom Soldiers On (1974), Nobs & Snobs (1976), Captain Blossom in Civvy Street (1978), and Fear No More (1989). Michael Nelson died in 1990.